I really am a big fan of roasted root vegetables, and right now beetroot is very much in season. I fully appreciate that it may not be everyone’s first choice of side vegetable, but it can be really versatile. If you only experience of beetroot is is a vacuum packed form which has been boiled/steamed to death then picked in the cheapest cooking vinegar, I would see a just cause to an objection. However, raw grated beetroot is a great accompaniment to a salad, but my favourite is roasted. Sometimes, I quarter beetroot, drizzle a little olive oil, a few drops of balsamic vinegar and season with sea salt, freshly milled black pepper, and a few chilli flakes. Beetroot, it would seem, is a great absorber of flavours, and even after 40 mins or so in an oven will retain a firm and almost crunchy texture. Quite often, I roast cubes of root vegetables in and always found they they did not roast evenly, and small cubes are quite fiddly to turn over when cooking. In order to overcome this challenge, I thought I’d whip out my much underused skewers and see if they could help. Whilst I do have a stack of bamboo skewers, I find the metal ones far superior – much easier to skewer the ingredients, but also will not snap or burn like their disposable counterparts. Threading raw beetroot, carrot, and sweet potato can be quite difficult due to their hardness – a strong metal skewer meets far less resistance. 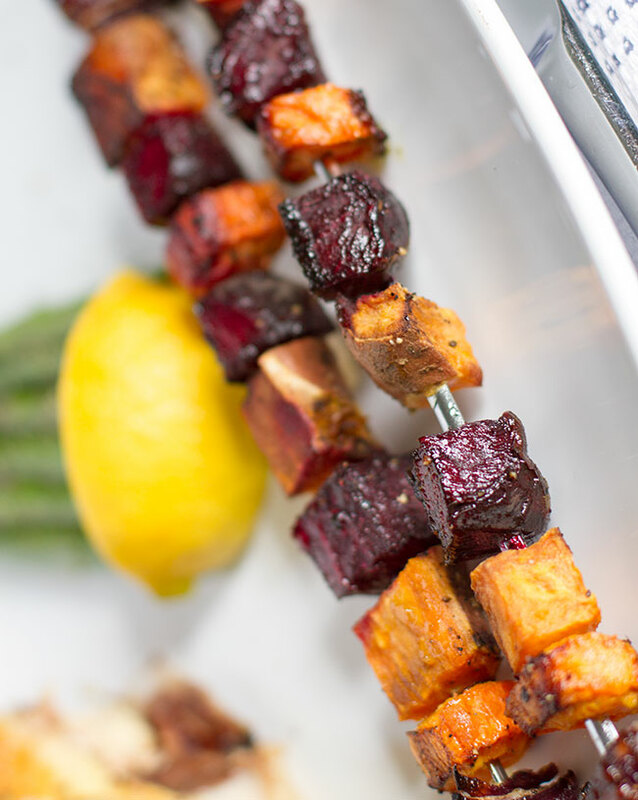 Word of advice: place the cubed ingredients you want to skewer on a hard surface and push down from above. If the skewer slips, you are going to avoid a potential and very painful spike through the hand (holding the ‘to-be-skewered’ ingredients) followed by a trip to A & E.
Equally, and one less desirable feature of beetroot – its incredibly colour transfers very quickly and easily and will strain a porous surface very quickly. When dealing with beetroot, so as not to give my favourite wooden cutting board a splodgy pink hue makeover (a while ago I had to sand down my board to get rid of all traces- I have since learned!) I use a porcelain plate to cut on. Problem solved! 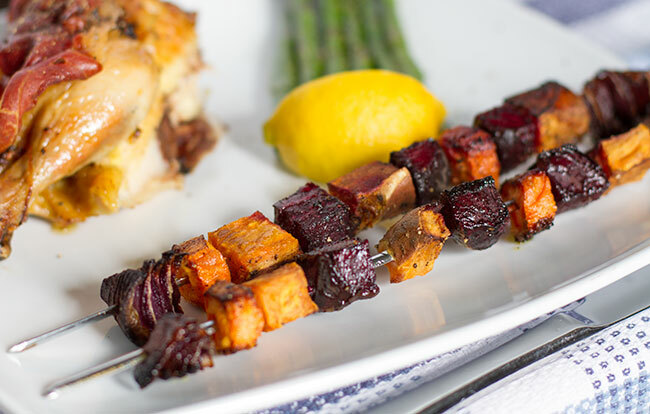 I think this roasted root vegetable skewers recipe is a great alternative to a more traditional roasted vegetable side, and takes just a few minutes to prepare. Preheat the oven to 200C, line a large baking trap with thick aluminum foil, and brush in a small amount of rapeseed oil. Peel onion, then cut vertically into quarters, then slice each wedge horizontally to make eight chunks of onion. Square off the root vegetables (if not perfectly square, no worries) and cut again into 15mm or so cubes. This saves peeling them as well. Thread each skewer carefully- sequence is entirely up to you. Combine balsamic vinegar and oil in a small ramekin, mixing well, and brush liberally over skewers. Season with sea salt, freshly milled black pepper and herbes de Provence. Place in pre-heated and lightly oiled oven tray, and roast for 40 - 45 minutes turning over every 10 minutes to ensure that each side is evenly roasted. Remove from oven, and server immediately. This recipe makes 4 skewers.